You are at:Home»Herbs»Rauwolfia serpentina (Linn.) Benth. Latin name : Rauwolfia serpentina (Linn.) Benth. Description : The root has anaesthetic, nervine and sedative properties. It has been employed for centuries for the relief of various central nervous system disorders, both psychic and motor, including anxiety states, insomnia, excitement, sexual aggression, maniacal behavior associated with psychosis, hypochondriasis, melancholia, schizophrenia, insanity, insomnia and epilepsy in Indian medicine for about 4000 years. 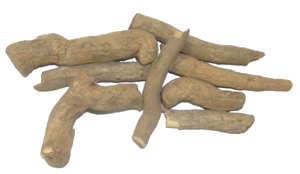 Extracts of the root are valued for the treatment of intestinal disorders, particularly diarrhoea and dysentery. It is also used as an anthelmintic. It contains Reserpine alkaloid which is used for mild, essential hypertension. Recommended Dosage : 500 mg to 2 g powder of dried roots. Contraindication : This herb is not recommended during pregnancy or lactation, in patients with low blood pressure, those with a history of mental depression, and active peptic ulcer and ulcerative colitis.